You can perform trimming while still in the standard mode by selecting and dragging a cut point. The edit result of trimming is dependent on the edit mode. The trimming type changes according to how the In and Out points are selected and keyboard combinations. For details on respective trimming methods, see the respective page. 1) Select the cut point of the trimming clip. Click the In point of the clip. Click the Out point of the clip. Click [Shift] + In point or Out point. Click [Alt] + [Shift] + In point or Out point. Click [Ctrl] + [Shift] + In point or Out point. Click [Ctrl] + [Alt] + [Shift] + In point or Out point. Click [Alt] + In point or Out point. Click [Ctrl] + [Alt] + center of the clip. Click [Ctrl] + [Shift] + center of the clip. Click the In or Out point of transition (clip transition, track transition)/audio cross fades. Click [Shift] + clip transition/audio cross fade. Ripple trimming is also possible with the ripple mode off. 2) Move the mouse cursor to the cut point or clip, and drag to the left and right when the mouse cursor changes shape. Adjust the range to be used while checking the video displayed on the preview window. The mouse cursor changes shape according to the trim mode. You can perform trimming by dragging the mouse on the preview window in the trim mode. The trim mode (transition) is not available in the preview window. 1) Click [Mode] on the menu bar, and click [Trimming Mode]. The preview window switches from the standard mode to the trim mode. 2) Select the trimming clip. 3) Click the respective button at [Trimming Mode] in the trim window, and select the cut point. The cut point changes color to green or yellow, and trimming is enabled. 4) Move the mouse cursor to the preview window, and drag to the left and right when the cursor changes shape. 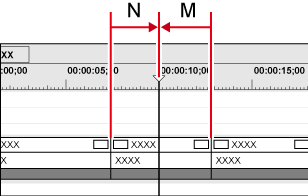 In the trim mode, the sequence timecode and the source timecode are displayed in the preview window, and you can execute trimming by entering numerical values. Move the mouse cursor to the timecode at the bottom of the trim window, and the mouse cursor changes shape. If you click in this state, a blue line is displayed under the timecode and numerical values can be entered. 5) Press [Enter] on the keyboard. The upper level is the timecode of the sequence, and the lower level is the timecode of the source. 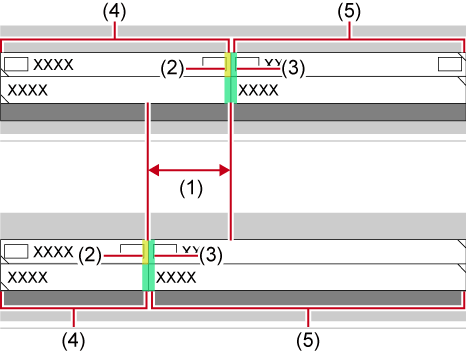 Numerical values can be entered in either level for trimming. * The items displayed may differ depending on the size of the preview window. The In and Out point sides of the timeline cursor can be trimmed by shortcut keys. You can perform trimming from the In point up the timeline cursor by [N] on the keyboard and from the timeline cursor up to the Out point by [M].The trimming type changes according to the keyboard combination. 1) Select the clip to be trimmed. You can also perform trimming on a selected transition (clip transition, track transition) and audio cross fades. To trim a track transition, select the mixer. 2) Move the timeline cursor to the trimming position. 3) Press a key on the keyboard to perform trimming.